With our Template Pack, get access to our template section. Easy to personalize with a flexible content and structure. 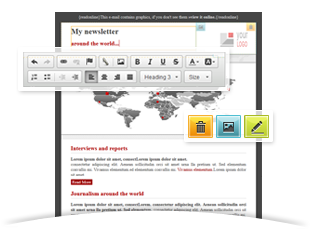 Thanks to the AcyMailing editor, replace pictures (insert your own banners, images and icons), change styles (titles, font, text-colors) and delete areas as you want. Our templates are tested with the main e-mail clients and ready to be used in AcyMailing. 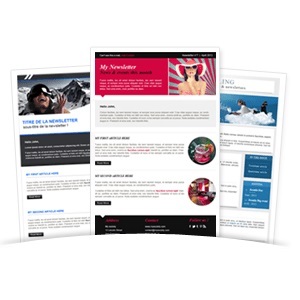 A responsive design is the key to display properly your newsletter on every devices : laptop, tablet and smartphones. Structure and content will adapt themselves to your screen. All default templates that you will find in AcyMailing are responsive. Our new templates are responsive. You can recognize them thanks to a special badge. take a look at our page : "Pack perso". Our responsive templates are properly displayed only on devices which support Media Queries. The result depends on the phone itself, on the email client and on the application that is used to read emails. Here is the list of clients which support our responsive templates.